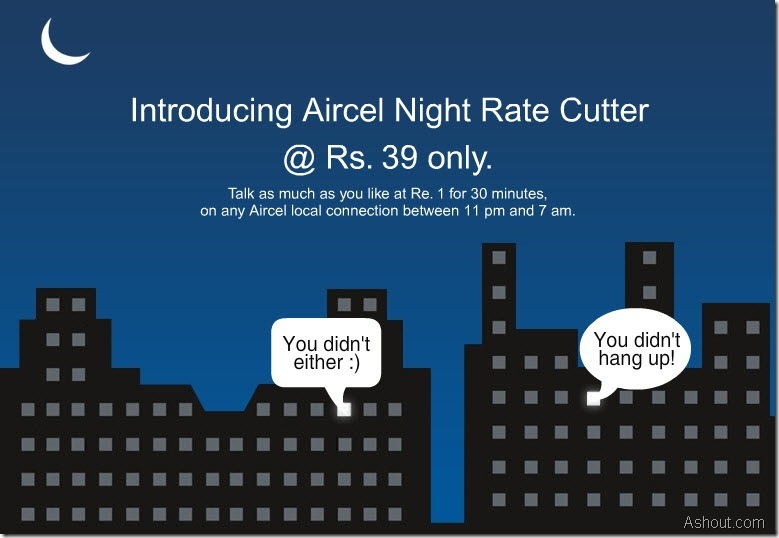 Aircel telecom today introduced a new Night calling pack called “Hello Nights” where we can call 30 minutes for just 1Rs. This offer is available only for Aircel Prepaid customers and not for post paid customers. To activate this Night calling pack Hello Nights you need to recharge your aircel mobile with aircel prepaid recharge coupon of Rs 39. As I told above, Hello Nights is a new offer for the aircel prepaid customers. With Hello Nights pack we can call 30 minutes to any local aircel customers with just 1Rs in between 11pm to 7am. This aircel night calling pack cost you Rs 39 and it valid for 30days from the day of activation with 0Rs talk time. This pack may benefit for the students or for the lovers who talk at night time for a long period of time. For example if you talk 2hours then you need to pay only 4Rs. If you are searching for good night calling pack or cheap calling plan, then give it a try to this night calling offer. If you’re not a aircel customer, then you may go and buy aircel prepaid sim card now because now in India sim cards costs you only 10Rs. Aircel to other network (Local & STD) @ Rs. 0.50/min. Available to only Prepaid Customers. Local Aircel Night calling (11pm – 7am) pulse will be 30 minutes. Note: Any other rate offer will not work along with Hello Nights till the validity of the Hello Nights product expires. I want sim card in aircel network. But i donot now the what is the offer for that. kindly can you give me information on that so i willing in the aircell network. note: and also GMS and CDMA. i hate airtel bkz they deduct 7 to 12 rs every day from my balance without any service. Please send the best plans on my mail id………..
i wnt to talk with my lover , which is the best sim for both? Plz reply me. please tell me the best std plan. I am extremely happy with the priority assistance that I get and the executives are also very helpful and understanding towards senior citizens.Happy to use the tariff plans. Sorry, this is very old article and I don’t know about any such offers.